The previous post was number 5,000 since I started this blog. It’s got to means something, right? I mean, wow. I’ve posted 5,000 posts on Le Café Witteveen. Do you know what it means? Well, do you? If you’re surprised, allow me to introduceConservapedia, the right-wing answer toWikipedia and ground zero for all that is scientifically and factually inaccurate, for political reasons, on the Internet. Claiming over 285 million page views since its 2006 inception, Conservapedia is the creation of Andrew Schlafly, a lawyer, engineer, homeschooler, and one of six children of Phyllis Schlafly, the anti-feminist and anti-abortion rights activist who successfully battled the Equal Rights Amendment in the 1970s. In his mother’s heyday, conservative activists were establishing vast mailing lists and newsletters, and rallying the troops. Her son learned that they also had to marshal “truth” to their side, now achieved not through the mail but the Web. Thanks to Becky for the Facebook post! These are beautiful, pre-computer logos that make my insides tingle with awe. Check out more of them here. What happens when you have access to paw light sabers and a pitbull gets in your way? 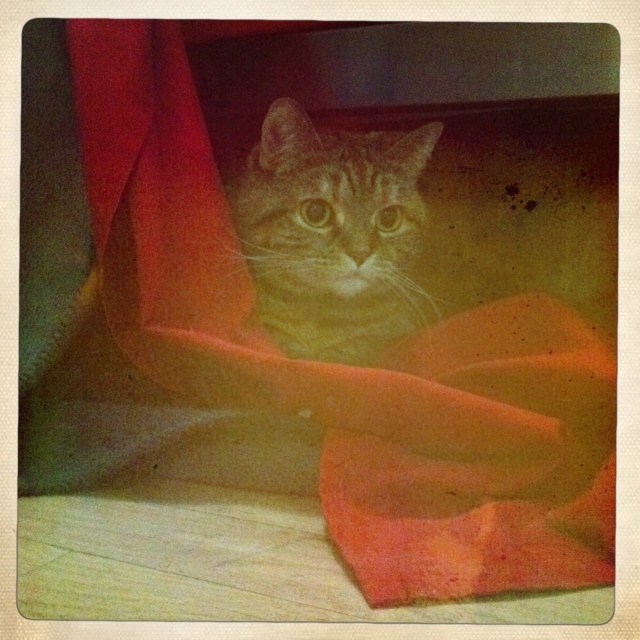 This fine Caturday is brought to you by Zoe looking cute draped in red. I ran out of Caturday pics that you guys submitted, so if you have any fresh ones … get ’em in. Over at Letters of Note, they published a letter written to the school board responsible for burning his books after a teacher used Slaughterhouse-Five in a class. A church-state watchdog group has spoken out against a road improvement program being reviewed by the Kentucky State Legislature due to it being connected to the construction of a Bible-themed amusement park. Americans United for Separation of Church and State has denounced the project, which would provide $11.1 million for various improvements to KY 36, a highway that is near the site where Answers In Genesis’ Ark Encounter Theme Park will be located. Known as the “Ark Park,” the theme park would showcase a life-size replica of Noah’s Ark, built in the same dimensions described in the Genesis account of Noah’s flood. Alex Luchenitser, associate legal director for Americans United, told The Christian Post that his organization opposes the monetary expenditure over its apparent religious entanglements.